Successfully Added Portable GPS Navigator and Multimedia Player (3.5 Inch Screen) to your Shopping Cart. Ultra-thin and stylish, this Portable GPS Navigator and Multimedia Player comes with a 3.5 Inch Touchscreen and offers amazingly easy-to-use and accurate GPS auto navigation on the go. Touch the simple menu on the large 3.5 inch LCD touchscreen to get an instant route to virtually anywhere in seconds. This portable GPS navigator includes an intuitive interactive screen which shows your route and position on the map, distance to destination, arrival time, street names and much more. You can even access previous routes or points of interest and rely on the voice guidance to offer worry-free directions without even looking at the screen. The SiRF Star III GPS receiver and built-in high-sensitivity antenna makes this portable GPS navigator one of the fastest and most reliable navigation systems in the industry. Along with functions like offroad recalculation and 2D/3D maps,, you'll have nothing to worry about on the road. 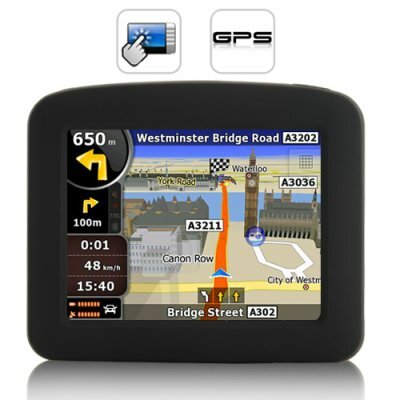 This GPS navigator also uses Windows CE 5.0 to provide compatibility with most brands of GPS software. This portable GPS navigator is also a fully functioning handheld multimedia center that supports up to 16GB of your favorite music, movies, pictures, and e-books. Play MP3 files through the built-in speaker or enjoy AVI and other video clips on the 3.5 inch screen and even though a stylus is included, the portable GPS navigator's touchscreen is so accurate that you can even use your fingers for maximum convenience. WARNING: Do not push power button too hard otherwise it is easy to get stuck. This portable GPS navigator seems unresponsive when I click? You need to double click when selecting menu items. This is to prevent "accidental" clicking. on 2011-08-11 20:46:34 I ordered this GPS, it works great. J'ai commandé ce GPS, il fonctionne très bien. I ordered this GPS, it works great.